Gerald; A dramatic poem: And other poems. London, Mitchell 1842.. VI, 2 Bll., 143 S., 1 w. Bl. Dunkelblauer Lederband d. Zt. mit RÃ¼ckenverg., Deckelfileten, Steh- und Innenkantenverg. und Goldschnitt. 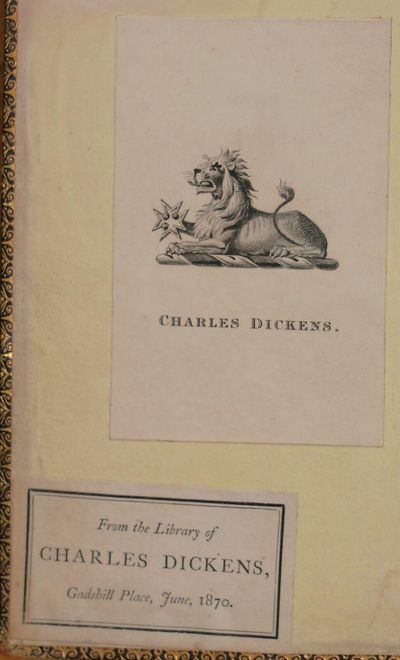 Mit dem bekannten Exlibris von Charles Dickens und der Verkaufsetikette "From the Library of Charles Dickens, Gadshill Place, June 1870". - Mit der gedruckten Widmung des Verfassers an Charles Dickens. - BestoÃŸen, unteres RÃ¼ckenende mit wenig Bezugverlust. Pietro Rolandi, 20 Berner's Street 1842 Edizione in 4 volumi rilegati in pelle con cofanetto in cartoncino con carta marmorizzata sui toni del verde. Taglio superiore delle pagine, titoli e decorazioni della costa dei volumi in oro zecchino 22 kt. Edizione del 1842, stampata a Londra. Illustrata da Ugo Foscolo. Condizioni: molto buone. Report of the Case of Edward Prigg Against the Commonwealth of. Fables de Florian. Suivies de Tobie et de Ruth, poemes tires de l\'Ecriture Sainte et précédées d\'une notice sur la vie et les ouvrages de Florian. London: S. and J. Bentley, Wilson, and Fley. 1842., 1842. Only Printing. Octavo, pp. l, 314. Collection of letters by an ancestor of General Charles Cornwallis of Yorktown fame. Bound in contemporary textured brown cloth with paper title square to spine. Very slight lean to the the bookblock, some spotting and dustiness to edges. Some bumping to extremities of the covers, some rubbing with the spine slightly tanned. Virtue & Co.  2 vols., 4to., First Edition, with 2 steel - engraved frontispieces (original tissue guards present), engraved and printed titles, and 129 fine steel - engraved plates, a few leaves very lightly spotted but all text and plates unusually crisp and clean; handsomely bound in nineteenth - century full brown calf BY CHARLES WESTERTON, sides with elaborate floral border in gilt enclosing multiple frame border in blind, backs with five raised bands, second and fourth compartments with leather labels (red/green respectively) tooled, lettered and numbered in gilt, all other compartments richly tooled in gilt to a floral design, gilt edges, primrose endpapers, broad doublures tooled in gilt with floral border, boards with a few insignificant scuffs and scratches else a most attractive, remarkably crisp, clean copy. THE BINDING IS SIGNED ON BOTH FRONT PASTE - DOWNS. Each volume includes a frontispiece and large title - vignette. This well - known work, among the best of the great nineteenth - century collections of steel - engravings, is not commonly found in such crisp, clean state. Kausler, Oberst Fr. von / Woerl, J. G.
Die Kriege von 1792 bis 1815 in Europa und Aegypten mit besonderer Rücksicht auf die Schlachten Napoleons und seiner Zeit. Karlsruhe & Freiburg Herder 1842 - 4°, 923 S., 136 Karten im Anhang, Halbld mit goldgeprägtem Lederrücken, der Buchrücken ist etwas berieben.Ecken und Kanten kaum bestossen. Am unteren Rand ist ein Wasserfleck der sich durch mehrere Seiten zieht. Das Papier ist bei einigen Seiten gebräunt, Vor allem wegen der sonst meist fehlenden Karten ein interessantes Exemplar zur Militärgeschichte Napoleons und der Befreiungskriege. 2642 gr. Leipzig: Georg Wiegand, 1842. The First Printed Edition of the Book of the Dead, The First Book Produced by Scribes in Anticipation of SalesLepsius, Karl Richard (1810-84). Das Todtenbuch der Ã„gypter nach dem hieroglyphischen Papyrus in Turin. 24pp. 79 full-page lithograph plates printed in black and red (3 folding), by Max Weidenbach. Leipzig: Georg Wigand, 1842. 318 x 267 mm. 19th century half calf gilt, marbled boards, light edgewear. Endpapers a bit foxed but fine otherwise. First Printed Edition of the Egyptian â€œBook of the Dead,â€ a loose collection of ancient religious / magical funerary texts intended to assist a dead personâ€™s journey into the afterlife. 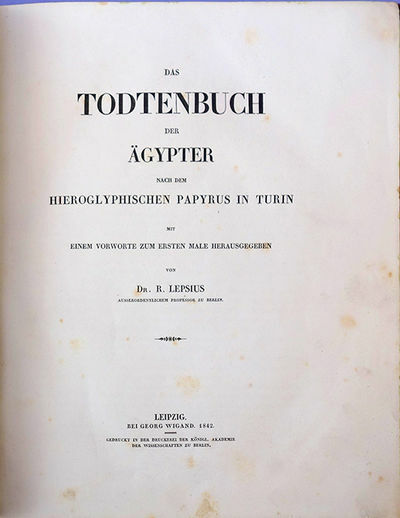 This category of Egyptian papyri was first given that name in this 1842 edition by Prussian archeologist Karl Richard Lepsius, one of the founders of scientific Egyptology.. Lepsiusâ€™s Todtenbuch der Ã„gypter reproduces by lithography the Ptolemaic papyrus known as â€œpapyrus Turin 1791.â€ In this edition Lepsius introduced his numbering system for the Bookâ€™s texts or â€œspells,â€ which is still in use today. There is no canonical version of the Book of the Dead. The Bookâ€™s spells derive from the hieroglyphic funerary texts carved on the walls of royal tombs and later written on coffins; the earliest identifiable spells from the Book, found on the coffin of Queen Menthuhotep, date from about 1600 B.C.E. Around 1550 B.C.E. papyrus copies of Books of the Dead, written in cursive hieroglyphic script, began to be substituted for wall carvings or coffin inscriptions. These were often prefabricated in funerary workshops, with spaces left for the name of the deceased to be filled in later; the Book of the Dead is thus the earliest text that was commercially produced by scribal workshops in anticipation of sale rather than written out on commission from customers. Rostock: G. B. Leopold's UniversitÃ¤tsbuchhandlung,, 1842. oder Untersuchungen Ã¼ber den EinfluÃŸ, den die Getreidepreise, der Reichthum des Bodens und Abgaben auf den Ackerbau ausÃ¼ben. Octavo (207 x 124 mm). 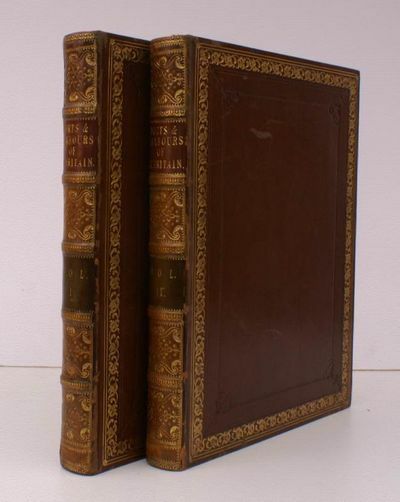 Contemporary dark brown half calf, red marbled boards, spine gilt in compartments, titles to spine gilt. With 3 folding tables and 2 hand-coloured folding diagrams. Bookseller's ticket to front pastedown. Corners a bit bumped and worn, spine ends and joints lightly rubbed, minor wear to edges of boards, prelims and endmatter slightly foxed, margin of text block gently toned with occasional spotting. Scarce second edition, revised and expanded, of the first part of ThÃ¼nen's (1783-1850) key work. Presentation copy inscribed by the author to his son on verso of front free endpaper: "Seinem lieben Sohn Heinrich zum dauernden Andenken, vom Verfasser, Tellow der 25. Dec. 1842". A pioneering economic study on agriculture, the second edition contains ThÃ¼nen's major theories, including the analysis of rent, location and resource allocation. As ThÃ¼nen states in the preface, important additions have been made, particularly to the 'statics of the soil' and the 'theory of rent', which form two central ideas of his theory (Thunen, p. v). Of this economic classic Schumpeter writes: "If we judge [ThÃ¼nen and Ricardo] exclusively by the amount of ability of the purely theoretical kind that went into their work, then, I think, ThÃ¼nen should be placed above Ricardo or indeed above any economist of the period, with the possible exception of Cournot" (Schumpeter, Critical Assessments, p.29). Der isolirte Staat in Beziehung auf Landwirtschaft und Nationalökonomie, oder Untersuchungen über den Einfluß, den die Getreidepreise, der Reichthum des Bodens und Abgaben auf den Ackerbau ausüben. Rostock: G. B. Leopold's Universitätsbuchhandlung, 1842 - Octavo (207 x 124 mm). Contemporary dark brown half calf, red marbled boards, spine gilt in compartments, titles to spine gilt. Bookseller's ticket to front pastedown. Corners a bit bumped and worn, spine ends and joints lightly rubbed, minor wear to edges of boards, prelims and endmatter slightly foxed, margin of text block gently toned with occasional spotting. With 3 folding tables and 2 hand-coloured folding diagrams. Scarce second edition, revised and expanded, of the first part of Thünen's (1783-1850) key work. Presentation copy inscribed by the author to his son on verso of front free endpaper: "Seinem lieben Sohn Heinrich zum dauernden Andenken, vom Verfasser, Tellow der 25. Dec. 1842". A pioneering economic study on agriculture, the second edition contains Thünen's major theories, including the analysis of rent, location and resource allocation. As Thünen states in the preface, important additions have been made, particularly to the 'statics of the soil' and the 'theory of rent', which form two central ideas of his theory (Thunen, p. v). Of this economic classic Schumpeter writes: "If we judge [Thünen and Ricardo] exclusively by the amount of ability of the purely theoretical kind that went into their work, then, I think, Thünen should be placed above Ricardo or indeed above any economist of the period, with the possible exception of Cournot" (Schumpeter, Critical Assessments, p.29). Goldsmiths' 32592 and 36776; Humpert 7984; Kress C.5974; Menger, cols 99 and 1013. Firenze, Soc. Ed. Fiorentina, 1842 - 1856.15 parti in 16 voll., più un vol. di supplemento. In - 4. Legature coeve in mezza pelle, dorsi con nervi, titolo e fregi impr. in oro. Con un ritratto, un facsimile e 67 tavv. ripiegate. Esemplare molto ben conservato e completo del volume di supplemento. Edizione monumentale che riunisce per la prima volta tutte le opere di o su Galileo. Un terzo del contenuto è formato da materiale inedito, tra cui la notevole corrispondenza con altri scienziati (circa 1600 lettere). Sia Riccardi I, 530 - 561, che Cinti, Galilei, 190, elencano dettagliatamente il contenuto. Brunet II, 1461: «... un corps d'ouvrage qui laisse bien en arrière toutes les précedentes éditions des oeuvres...» «First complete edition of Galielo's works, including his life by his disciple Viviani, and his valuable correspondence with some of his most celebrated contemporaries, in itself forming valuable material on the state of science during the beginning of the XVII. century, and the history of his time» (Sotheran, suppl. II / 1, 527). With a portrait, a facsimile and 67 folding plates. A very good set, uniformly bound in contemp. half calf, spines gilt. NP [prob. Spain]: NP , 1842. 45x64.5cm. 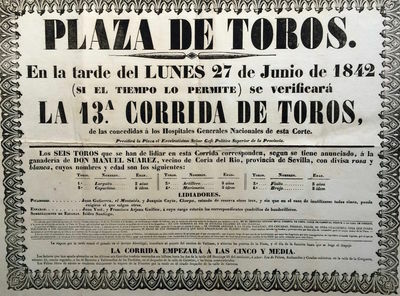 Wonderful and very scarce example of a bull-fighting poster from the early 19th century. The names of the matadors and the bulls (with ages) - "Artillero, Capuchino, Brujo, etc. - are given. The bulls are all from the famous "ganaderia de Don Manuel Suarez, vecino de Coria del Rio, provincia de Sevilla..." -- as well as prices of seats. Also, "se previene" the throwing of oranges and orange peels, stones and sticks into the arena, not to mention "banderillas de fuego, perros de presa..." etc. In our years of dealing in hispanic material, we have never seen anything like this of an earlier vintage, and the condition is spectacular. Images available on request. Condition is fine. Sydney: J.S. Prout, 1842. Tinted lithograph, page size approx 230 x 365 m, corners tipped to backing sheet. 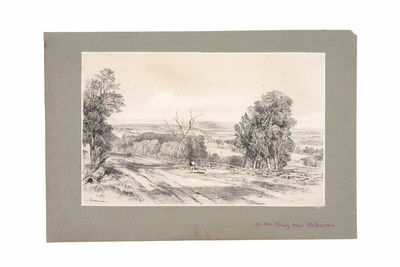 Charming Victorian rural scene by a pioneering Australian lithographic artist.John Skinner Prout was "the first itinerant painter in the colonies whose work ceases to be dominated by the requirements of topographical accuracy" (Smith, European Vision in the South Pacific). He arrived in the colony in 1841 and began lecturing at the Sydney Mechanics School of Arts and sketching around Sydney He made extensive sketching tours of New South Wales, before travelling to Van Diemen's Land in January 1844 where he worked for four years before returning to England. Pilze - Harzer, Carl Aug. Friedr. Naturgetreue Abbildungen der vorzüglichsten essbaren, giftigen und verdächtigen Pilze, mit besonderer Rücksicht auf die verschiedenen Altersstufen von der ersten Entwickelung bis zum ausgebildeten Wachsthume. Georgia Illustrated in a Series of Views, Embracing Natural Scenery and Public Edifices, Engraved on Steel by Rawdon, Wright, Hatch, and Smillie, from Sketches Made Expressly for this Work, by T. Addison Richards; Accompanied by Historical and Topographical Sketches, by Our Own Writers. Vorstadt Au, den 5. Mai 1842. Die heutige Vorstellung eröffnen: Die beiden Chinesen, ausgeführt von Herrn Creter und dem Komiker Herrn Pichler. - Eine militärische Scene. Der polnische Lancier, seine Fahne vertheidigend in der Schlacht bei Smolensk, ausgeführt von Hrn. Koßmeier etc. Wiener Zeitschrift für Kunst, Literatur, Theater und Mode. Jahrgang 1842. HAVENGEZICHT ROTTERDAM"SHIPS OF THE GENERAL STEAM NAVIGATION COMPANY, OFF ROTTERDAM". Aquatint uit 1842 van de hand E. Duncan naar het ontwerp van marine schilder William John Huggins met de Giraffe en de Ocean, stoomschepen die with Her Majesty"s Mail aankomen in en vertrekken uit Rotterdam. Op de voorgrond worden Hollanders naar de kade overgebracht.Beide raderstoomboten werden te water gelaten in 1836 en ingezet als stoomschepen voor het vervoer van post door de Britse General Steam Navigation Company (GSNC) . De Giraffe deed later dienst tijdens de Amerikaanse burgeroorlogDe GSNC werd opgericht in 1824 en was anderhalve eeuw Londen"s voornaamste bedrijf voor short-sea shipping. De GSNC had een paar diensten naar Portugal, Gibraltar en zelfs Afrika en Noord- en Zuid-Amerika, maar men voer met name op routes tussen de havens van Groot-Brittannië en Noord-West Europa.Prijs: 1.500,- (incl. lijst). Journal of an exploring tour beyond the Rocky Mountains, under the direction of the A.B.C.F.M. in the years 1835, '36, and '37. Ithaca, NY: Mack, Andrus, & Woodruff. 12vo (20 cm, 7.9"). 408 pp. ; 1 map, 1 plt.. 1842 Third edition: "A description of the geography, geology, climate, productions of the country, and the numbers, manners, and customs of the natives." The Rev. Samuel Parker (1779–1866) accompanied a fur-trading party west into what was then known as either Oregon Country or the Columbia District, under the sponsorship of the American Board of Commissioners for Foreign Missions. Here he describes the voyage (including a brief mention of the Mormons in Missouri), the region's natural history, and the degrees of interest in Christianity expressed by the Native Americans his party encountered — which last was his primary focus. The volume opens with an => oversized, folding map, engraved by M.M. 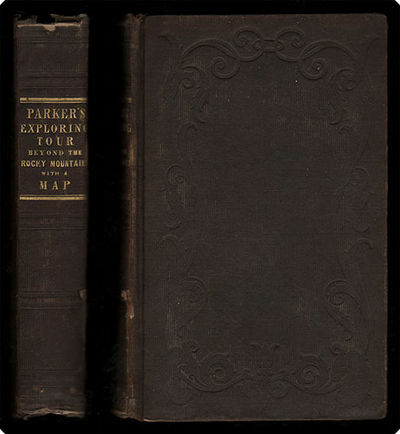 Peabody, which Graff describes as "the earliest map of the Oregon interior with a pretense to accuracy"; includes an account of Parker's => voyage to Hawaii and Tahiti; and closes with a => vocabulary of Indian languages (Nez Perce, Klicatat, Calapooa, and Chenook). The plate depicts "Basaltic Formations on the Columbia River. 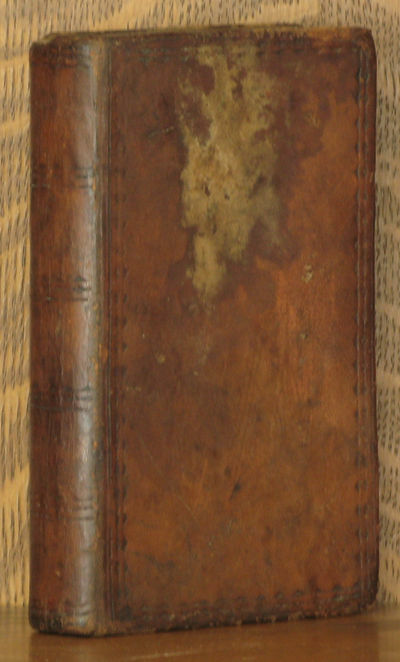 Publisher's charcoal-colored ribbed cloth, covers with blind-stamped arabesque frame, spine with gilt-stamped title; cloth chipped at spine extremities and front joint, corners rubbed. Mild to moderate foxing. Map with faint spotting, a pinpoint hole at one corner, and one very short tear from inner edge; foxing and soiling, never dark/nasty but present throughout. A comfortably solid copy. Venice: Giuseppe Antonelli, 1842. 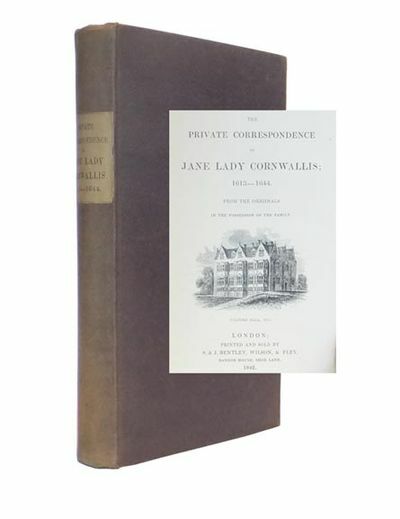 Single volume bound as two, with a total of 88 lithographic plates, all but four of which are handcoloured; scattered foxing, some plates thumbed at the margins and two with old paper repairs; a very good copy in recent half library binding, bound without sectional title-page, index leaves loosely inserted. A tremendous series of coloured images appears in this vibrant and diverse Italian ethnology of the Pacific and Americas, an entire volume from a larger series covering the peoples of the world. With a total of 88 plates, of which the vast majority are handcoloured, this volume of the Galleria Universali di tutti Popoli del Mondo covers the entirety of the Americas, Australia and the Pacific islands. The medium of lithography allowed the reproduction of engraved images from earlier publications for popular works of this nature. Ten of the plates depict Australian Aboriginal subjects, and are derived from a wide variety of sources including the First Fleet accounts of Governor Arthur Phillip and Captain John Hunter. Other sources include the Baudin voyage artists Nicolas-Martin Petit and Charles-Alexandre Lesueur, while the iconic images of Tasmanian Aborigines originate from the official account of Captain Cook's third voyage.Other Australian subjects of interest include a view of Sydney Harbour, the Blue Mountains and the church at Parramatta. The Pacific islands are richly represented, including indigenous rituals, burials, costumes and the like. Images originate from the voyages of Cook, Kotzebue, Duperrey and others. Of particular interest is a plan of an outrigger canoe of the Caroline islands. [Fildes, Sir Luke- Fine Watercolor Painting] "Sophia"
Fildes, Sir Luke- Fine Watercolor Painting] "Sophia"
- Offered here is a superb Pre-Raphaelite style watercolor painting by Sir Luke Fildes (1842 1927), and dated 1875, entitled "Sophia," (not on painting, but per an earlier auction description). Watercolor, heightened with white, signed and dated by the artist, lower left, with his monogram "L. F.", 1875." 15 x 10 inches on watercolor paper mounted onto a slightly larger card backing Fine condition. 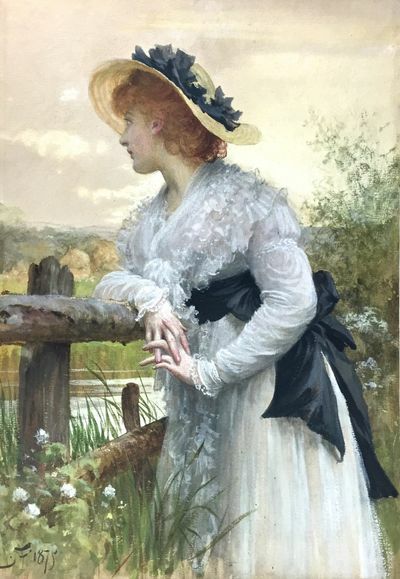 A wonderful Pre-Raphaelite style painting with superb detail and coloration by this important artist, known especially for his compositions and fine interpretation of dress, especially lace. He is widely regarded as one of the leaders of the Neo-Venetian School. Fildes was recommended by pre-Raphaelite founder John Everett Millais to Charles Dickens, who hired the artist after a 15-minute interview. FildesÕ drawing in ÒThe Graphic,Ó just after DickensÕ death, of an empty chair in his study, found wide acclaim and inspired Van Gogh&#146;s painting, "The Yellow Chair." Naturwissenschaft - Bernard, P(ierre), Couailhac, L(ouis), Gervais, (Paul) et Lemaout, Emm(anuel). Le jardin des plantes. Description complete historique et pittoresque du Muséum d'histoire naturelle, de la ménagerie, des serres, des galeries de minéralogie et d'anatomie, et de la vallée suisse. Moeurs et instincts des animaux, botanique, anatomie comparée, minéralogie, géologie, zoologie; . Deuxième partie. Oiseaux, reptiles poissons, insectes et crustacés. Par Emm. Lemaout. Fortress of Akabah. Arabia Petrae. Feby 28th 1839 Original hand colored lithograph. F.G. Moon. 1842-45.Small landscape., London - Published in "The Holy Land, Syria, Idumea, Arabia, Egypt and Nubia". Subscriber&#146;s copy, the lithographed plates finely coloured by hand and mounted on card (full sheet ca. 44 x 62 cm). Slight foxing in the sky. Virtue & Co.,, . 2 vols., 4to., First Edition, with 2 steel-engraved frontispieces (original tissue guards present), engraved and printed titles, and 129 fine steel-engraved plates, a few leaves very lightly spotted but all text and plates unusually crisp and clean; handsomely bound in nineteenth-century full brown calf BY CHARLES WESTERTON, sides with elaborate floral border in gilt enclosing multiple frame border in blind, backs with five raised bands, second and fourth compartments with leather labels (red/green respectively) tooled, lettered and numbered in gilt, all other compartments richly tooled in gilt to a floral design, gilt edges, primrose endpapers, broad doublures tooled in gilt with floral border, boards with a few insignificant scuffs and scratches else a most attractive, remarkably crisp, clean copy. THE BINDING IS SIGNED ON BOTH FRONT PASTE-DOWNS. Each volume includes a frontispiece and large title-vignette. This well-known work, among the best of the great nineteenth-century collections of steel-engravings, is not commonly found in such crisp, clean state. Cirque Olympique. Vorstellung in vier Abtheilungen. (Breslau), 8. 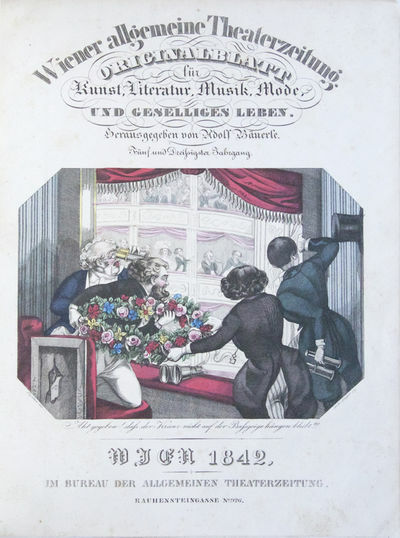 März 1842. Mit Holzschnittabbildung (19x 20 cm). Einblattdruck. 46 x 56 cm. Der bei dem berühmten Pferdeartisten Rudolph Brilloff ausgebildete Ernst Jakob Renz (1815-1892) übernahm 1842 das Brilloffsche Unternehmen und führte es als \"Circus Olympic\" und später als Circus Renz bis 1897 fort. Mehrere Nachfahren betreiben noch heute Zirkusunternehmen mit dem Namen Renz. - Vorliegendes Plakat vom 8. März 1842 gibt allerdings noch Dietrich Gautier (vgl. Otto, Artisten-Lexicon, p. 76-77) als Direktor an. Die etwas merkwürdige Illustration zeigt einen Löwen oder Tiger, der sich an seinem Seilende festgebissen hat und von 3 Helfern mittels eines Flaschenzugs bis unter die Zirkuskuppel gezogen worden ist. Rechts zeigt sich der Direktor mit einer Gerte in der Hand. - Unbeschnitten. Mit horizontaler und vertikaler Falte. Mit kleineren Randdefekte und kürzeren Einrissen in den Faltungen. Versand D: 5,00 EUR Einblattdrucke. Vorläufige Kunst - Anzeige. Mit obrigkeitlicher Bewilligung wird F. Becker, Professor nebst Gesellschaft aus Berlin, während der bevorstehenden Jacobi - Dult die Ehre haben, täglich zwei Vorstellungen aus dem Gebiete der natürlichen Magie, Experimentalphysik etc., verbunden mit athletisch - gymnastischen Zwischenspielen des Herkules Kroß, jede in 3 Abtheilungen, bei brillanter Beleuchtung und gutbesetztem Orchester zu veranstalten. Voyage dans la Russie Méridionale et la Crimée, par la Hongrie, la Valachie et la Moldavie, exécuté en 1837 . dédié à S.M. Nicolas Ier, Empereur de toutes les Russes: ATLAS D'HISTOIRE NATURELLE. Statistica dell'Italia del Conte L. Serristori. 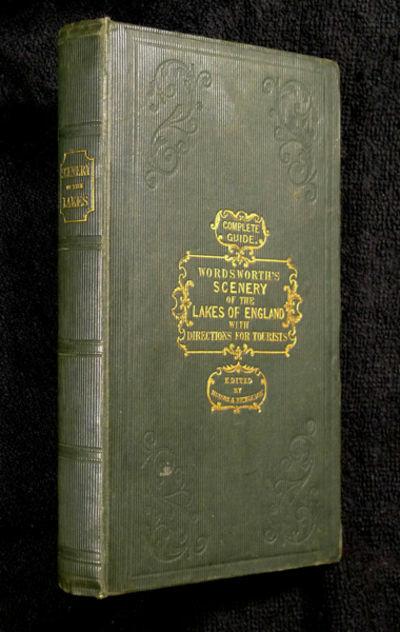 A Complete Guide to the Lakes: comprising Minute Directions for the Tourist, with Mr. WordsworthÂ’s description of the Scenery of the Country, &c. and three letters upon the Geology of the Lake District, by the Rev. Professor Sedgwick. 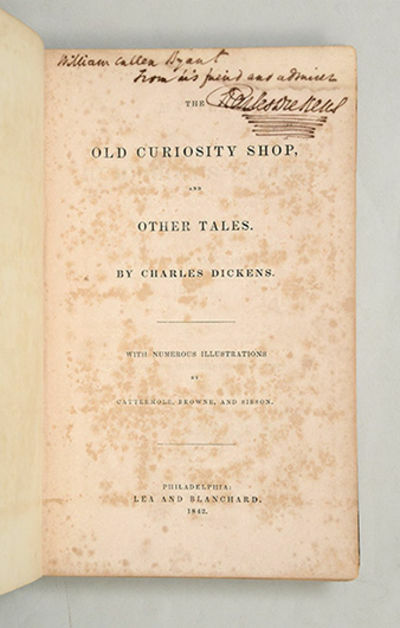 Kendal:: Hudson and Nicholson; also London: Longman; Whittaker;, 1842.. First edition.. Hardcover. Very Good+. vii, [i], viii, 134; [ii], 82; 55; plus nine engravings with guards, of which four are scenes, one a plan, and the other four are cross-sections of terrain. The foldout hand-coloured map at the back is in very good clean condition. Neat early ownership name to front free endpaper. Light foxing affecting the plates, and some page edges. 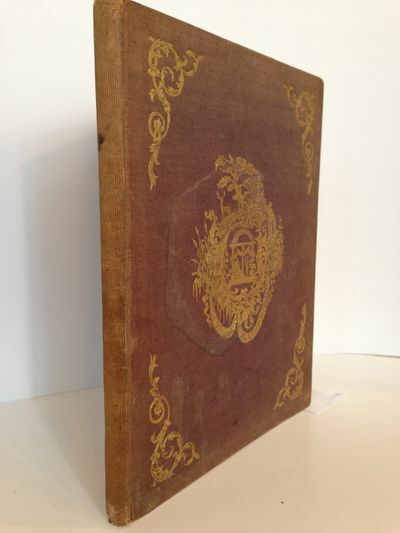 Firm, in the original dark green ribbed cloth binding decorated in blind and titled in gilt. A very attractive copy. Mecklenburg in Bildern, Originalansichten, Nationaltrachten, Militair- u. Portraitblättern. 4 Teile in 1 Bd. Wien: Im Bureau der allgemeinen Theaterzeitung. 1842; 1846; 1849. FÃ¼nf und Dreissigster Jahrgang. Wien: Im Bureau der allgemeinen Theaterzeitung, 1842. Folio. 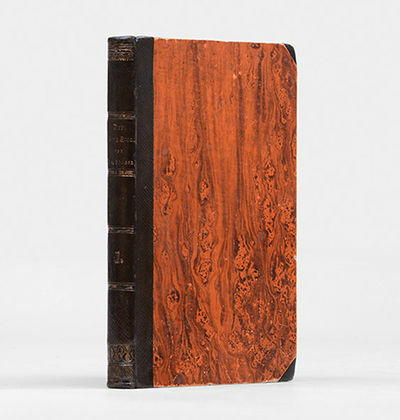 Contemporary marbled boards with dark orange title label gilt to spine. 1f. (title with large hand-coloured engraving of theatre-goers by Andr. Geiger after Cajetan. 696 pp. A total of 155 numbers printed in two columns per page. Nos. 73 and 74 (pp. 329-336) misbound between pp. 352 and 353; No. 101 (pp. 445-448) lacking. Minor and occasionally moderate foxing; some staining. In very good condition overall. Oesterreichischer Courier, frÃ¼her: Wiener allgemeine Theaterzeitung. 1849. Folio. 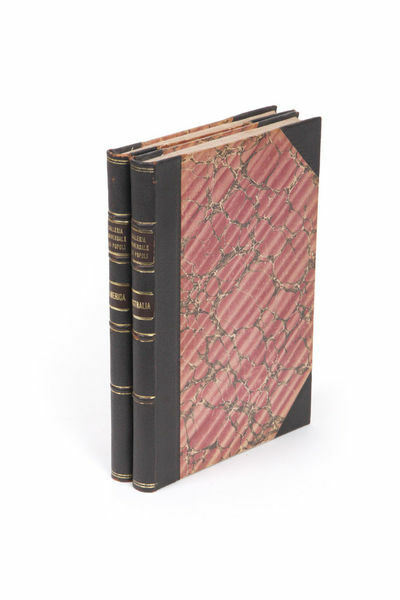 Brown cloth-backed marbled boards with titling gilt to spine. 1240 pp. + 10 fine hand- coloured engraved plates in smaller format relating to fashion, politics, and the theatre. A total of 244 of 310 numbers. No. 158 (pp. 629-632) misbound between nos. 135 and 136. Binding worn, rubbed and bumped; head and tail of spine worn and frayed. Mostly minor foxing; scattered minor stains; lacking title. With armorial bookplate of Adolphi Comitis Dubsky de Trzebomyslitz (1833-1911). With separately-published Beilage and miscellaneous issues of the Wiener Abend Courier. 3 years (bound in 4 volumes) of this noted Viennese periodical covering music, opera, theatre, literature, fashion, satire, etc., some in rebus format, with numerous reviews of performances in major European centers. Fellinger: Verzeichnis der Musikzeitschriften des 19. Jahrhunderts 17. The volumes contain a total of 56 highly attractive hand-coloured engravings, many humorous. . The 1849 volume from the library of Earl DubskÃ½, originally in Zdislavice, later moved to HoÂštice. The Works of Robert Burns. Complete in one Volume. With Life by Allan Cunningham. Schweizer-Archiv für Thierheilkunde. Herausgegeben von der Gesellschaft Schweizer. Thierärzte. Redigierte von Dr. A. Guillebeau, E. Zschokke, Dr. E. Wyssmann, Prof. A. Borgeaud, Prof. Dr. W. Frei, G. Giovanoli, Frau Grossenbacher, Prof. Dr. E. Hess, Dr. K. Schellenberg, Dr. H. Schwyter, M. Strebel u.v. Anderen. Orell Füssli AG., Zürich. 1842 - Zürich. Orell Füssli AG. 1842, 1883-1954. 8°. Band 3 (neue Serie) 1842, Bände 25 - 96 (1833-1954). Halbleinenbände mit Pappdeckeln (Bibliothekseinbände) mit handschriftlichen Rückenschildchen und Original Leindenbände. Leicht berieben. Durchgehende Sammlung dieses Periodicas von 1883 bis 1954. - Das Schweizer Archiv für Tierheilkunde (SAT) ist die älteste veterinärmedizinische Zeitschrift der Welt (gegründet 1816). Die Zeitschrift erscheint monatlich in deutsch und Französisch und erreicht die Mitglieder der Gesellschaft Schweizer Tierärztinnen und Tierärzte sowie weitere interessierte Kreise. Die Fach- und Verbandszeitschrift dient der Verbreitung des Veterinär-medizinischen Wissensund fördert die Attraktivität und das Ansehen der Tierärzteschaft. - Ursprünglich erschien die Zeitschrift unter dem Namen "Archiv für Thierheilkunde". Halbleinenbände mit Pappdeckeln (Bibliothekseinbände) mit handschriftlichen Rückenschildchen und Original Leindenbände. Ueber das Schielen und die Heilung desselben durch die Operation[. Cenni sulla vita di Antonio Solario, detto Lo Zingaro [and other works]. Napoli, Serafino Prestia, 1842. - 4to. 47, (1) pp. With 2 engr. plates. (Bound with) II: Giotto in Napoli e i Giotteschi Napoletani. [Naples, 1848]. (227)-245, (1) pp. III: Della pittura Napoletana prima di Giotto. [Naples, 1848]. (15)-22 pp. IV: Della pittura Napoletana nella prima meta' del secolo XVo. [Naples, 1848]. (1), (192)-200 pp. Contemp. vellum with giltstamped red spine label. Four works on Neapolitan art history by Nicola Laviano (1802-93), the latter three being offprints from the Museo di Scienze e Letteratura (N.S.) XIV-XV. - Vellum covers slightly warped. From the library of the Ducs de Luynes at the Château de Dampierre: their bookplate reproducing the arms of Charles Marie d'Albert de Luynes (1783-1839), 7th Duc de Luynes, on pastedown. ICCU SBL\0747323.